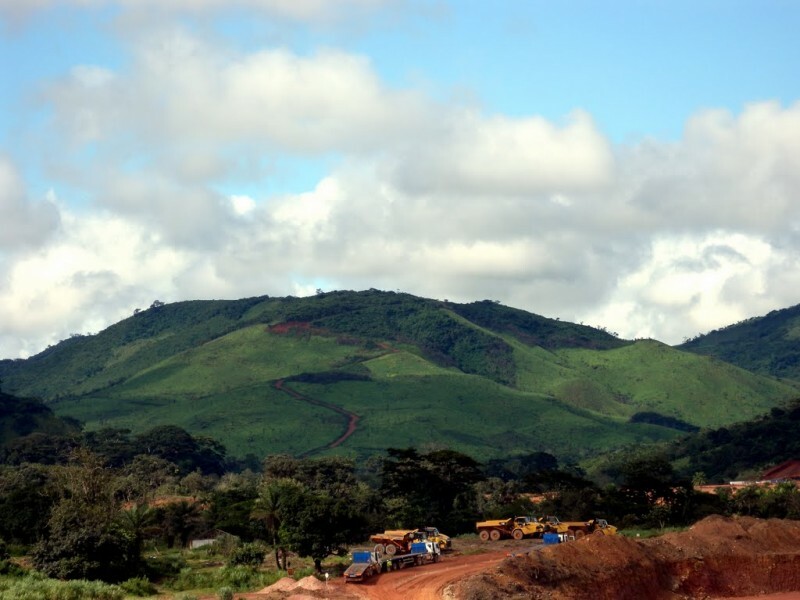 African Minerals Ltd., Sierra Leone’s largest mining company is in hot water again. Owned by the Chinese and regarded by the government as its crown jewel, the company is under tremendous pressure as iron ore production and export sales struggle to recover. The last three years have proved quite turbulent for the company, despite its significant contribution to Sierra Leone’s GDP, which in 2011 made a huge jump from 4.5% in 2010 to 11% – one of the highest growth rates in Africa. But bad management, under-reporting of corporate financial affairs and corruption, as well as the government’s failure to provide adequate governance oversight, brought the company to its knees in 2013, and was declared bankrupt. The company’s rise to fortune in Sierra Leone, since 2007 has not been without huge social and reputational costs. It had been accused by workers and local residents of Tonkolili district of paying peanuts to the local workforce, and operating under poor working conditions. Residents living near the mines have also protested against what they regard as serious violation and abdicating of its corporate social responsibility. 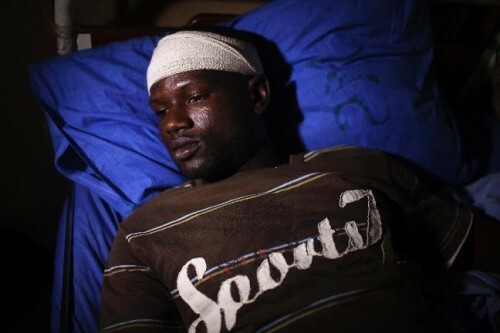 According to reports by the London Guardian newspaper and Mining.Com, African Minerals Limited is being sued in a London court over allegations that it evicted residents and violently mistreated workers and villagers living close to one of its mines in Sierra Leone. The iron ore company, whose Tonkolili project was its flagship before being put on care and maintenance in 2014, “is accused of complicity in false imprisonment, assault and battery, trespass and theft of the claimants’ property. It is also allegedly implicated in a fatal shooting of a 24-year-old by police during a protest over pay and conditions,” according to a weekend report in The Guardian. The multi-million-pound lawsuit will involve 142 claimants who are aiming to receive compensation for injuries sustained during two incidents in 2010 and 2012. African Minerals denies the allegations and says it has “no vicarious responsibility” for actions taken by police and that English courts lack jurisdiction in Sierra Leone, states the media report. 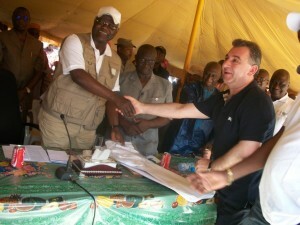 (Photo: President Koroma signed mining agreement with African Minerals). It’s just the latest piece of bad news for African Minerals, which used to list on the London Stock Exchange but now trades over the counter as a penny stock. The company was heavily impacted by the Ebola crisis in 2014. In December of that year, the combination of a lack of investment and slumping iron ore prices forced the miner to halt its operations. In April of this year Shandong Iron and Steel Group acquired the remaining 75 percent of Tonkolili for around $170 million. The Chinese steel company said in April that it planned to return the mine, which is the second largest iron ore mine in Africa, to full production during the wet season. So the queen was very very right when she said the Chinese had been rude to British officials. Well if they can be so rude to British officials, what will they do to Sierra Leonean villagers – they will kick them to the gutter. It is time they are run out of town. These people who had no clout in the world, suddenly find themselves rubbing shoulders with the great and mighty. They cannot believe it and have become cocky with it. Now our silly politicians want to allow them to use our ‘fat to fry us’ by lending us an enormous amount of cash and build us an unnecessary airport. They will utilise it to fritter away our mineral resources to China. The case regarding the affairs of African Minerals under the management of the Chinese in Sierra Leone had gone wrong from the beginning of the operation of the company under the eyebrows of the APC Government of the so called President Ernest Bai Koroma, as long as his pockets are filled by the Chinese. “A situation in which one party is held partly responsible for the unlawful actions of a third party. The third party also carries his or her own share of the liability.” Vicarious liability can arise in situations where one party is supposed to be responsible for (and have control over) a third party, and is negligent in carrying out that responsibility and exercising that control. For example, an employer can be held liable for the unlawful actions of an employee, such as harassment or discrimination in the workplace. Even though the employer is not the one who committed the unlawful act, the employer is held liable because it is considered responsible for its employees’ actions while they are on the job and it is considered to be able to prevent and/or limit any harmful acts performed by its employees. The employer may be able to avoid vicarious liability by exercising reasonable care to prevent the unlawful behavior. Another common source of vicarious liability occurs when a child behaves negligently. The parent can sometimes be held vicariously liable for the child’s actions. One situation where this might occur is if a child injures or kills someone while driving. With explanation of the above, how can the Chinese management say that they do not hold vicarious responsibility in their operations in Sierra Leone, If they do not hold the guarantee that they are highly protected by our president? I guess they are aware of the fact that the only way to succeed in business in Africa is through corruption. I agree. I worked on this project. Terrible management from African Minerals Limited – top to bottom. I worked on the rail project. The treatment by the Chinese of local people was appalling. You need to get the Chinese out, or your people will rebel again. Very sad.